The unsustainable use of resources results both in environmental damages and economic risks. In Europe, sustainable use of resources is of particular importance because the continent relies on imported resources much more than any other part of the world: 40% of raw material used on the European Union is imported. Bay Zoltán Nonprofit Ltd. can connect to all of the above mentioned areas due to its wide range of research, development, service and knowledge management activities. ’Circular economy’, in which all non-renewable material circulates in a closed cycle, is the most important instrument to improve resource efficiency. In a circular economy, all material is considered usable or re-usable raw material and ideally, new materials (whether they are renewable or not) would only be used when secondary raw materials are not available. By the application of waste hierarchy (prevention, re-use, recycling, recovery, disposal) best utilisation of products can be reached, so waste production can be practically reduced to zero, creating a chance to switch the whole economy to the so-called zero waste model. 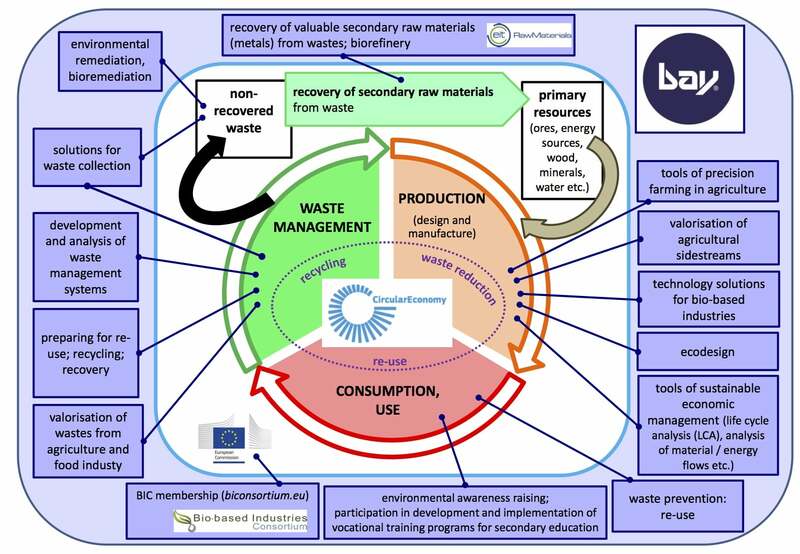 The picture below shows our activities that contribute to certain processes of circular economy.